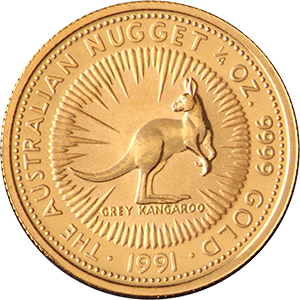 The 1/4 oz Australian Nugget is the third smallest weight of the series and is therefore popular with small and large investors and collectors alike. It weighs 7.78g (0.25 oz), has a diameter measuring 20.10mm and a thickness of 1.30mm. Its face value is $25, but as the coin is of such high purity, 24 carats, its gold content alone is worth many times more. Produced by the world-renowned Perth Mint, its design it has a milled edge and two-toned effect, making it one of the most stunning modern coins produced by government mints in the world. The obverse depicts Queen Elizabeth II and reverse an animal design, typically a kangaroo. The design is modified annually and as such attracts many collectors. It was first introduced in 1986 and quickly became one of the most general gold coins on the market. It’s purity of 0.9999 gold is among the very highest in the world, and as such is one of the most valuable. As fine gold, such as contained in the 1/4 oz Australian Nugget, has such a high concentration of the precious metal, it can damage easily. One of the unique features of the Nugget is it is encapsulated by hard plastic, offering protection and an attractive sheen that is often commented on by the coin’s advocates. The 1/4 oz Australian Nugget is the second smallest weight of the standard measures (1/10 oz being the smallest). But there are several options to choose from, with the 1kg being the largest. That is not to say that the Perth Mint stops at the 1kg mark, however. In 2011 it released a world record 1 tonne coin, worth an approximate $A53m. It’s 80cm diameter is comparable to the height of actor Vern Troyer of Austin Powers fame.